19a. [Inferior movie segment? ], LESSER – well something is obviously missing here, but what is it? 32a. [“Calm down, buccaneer!”? 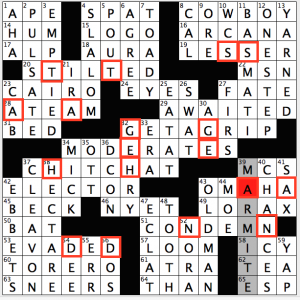 ], GET A GRIP – no one north of Tampa Bay would use the term “buccaneer” unless they had a good reason to avoid the term “pirate.” And looky here, the letters of PIRATE appear in the theme answer with two G’s left over. The game is afoot! 34a. [Curbs the excesses of fame? ], MODERATES – does STARDOM equate to fame? 37a. [Gossipy conversation method? ], CHIT CHAT, here the “backwards word” is TACTIC for method. 51a. [Disparage Bordeaux wine? ], CONDEMN, MEDOC was hard to see here. 53a. [Steered clear of overhang? ], EVADED – I like how my moniker “Evad” (Dave backwards) is also hidden in this word. So the idea here is to complete the two-word theme phrases by removing the same letter twice and reading the word in the opposite direction. Reading those “dropped” letters in order from top-to-bottom, we have STAGEHAND, indeed not only a theater employee, but one who likely deals with backdrops on sets. Et voilà! I loved the intricacy of this meta; this type of wordplay is classic Patrick Berry material. The idea is clever, the title is a clever way to describe what is going on, and the meta solution has a clever tie-in to the meta concept. It doesn’t get any better than this, folks. If I were to have any criticism, it’s that this meta is almost impossible not to stumble across, as it’s obvious that the theme entries as they appear in the grid are incomplete, and the clues are obvious enough to determine what word is missing. But this is a minor nit in the presence of a master at work. So much theme material (how many other 15×15’s have 9 theme answers?) did force a few infelicities in the fill (ONE-STEP and YARNED protruding in the northeast seem to be the sorest of thumbs I see), but I did enjoy seeing my friend the LORAX in the grid as well as the timely entry ELECTOR, clued as [Member of a certain college]. See y’all next week! This was great for someone like me who never really cared for “meta” puzzles. Maybe, too, that’s why I found the final answer easier than usual. Usually, that is, we’ve either an unthemed grid plus a theme answer, or a grid with theme answers plus a second, unrelated theme answer. Here the theme fill was interesting and challenging, and figuring it out was the key to the additional answer. I first ignored the extra words in theme clues. Maybe I was just missing the point and the clue would do. Then I puzzled over it. In due course, it was spotting letters from PIRATE in an answer and connecting it to the extra portion of the clue. From there, it was easy to look for more like it. Fun, too. Congratulations! Did they tell you how many people got the right answer? I didn’t get the depth of this META.